So… what was I supposed to do? I had this great planner. I have a blog where I offer planner printables. I have an etsy shop where I sell printables and stickers. I couldn’t NOT use my planner. I would be a planner girl hypocrite… am I right?!?! 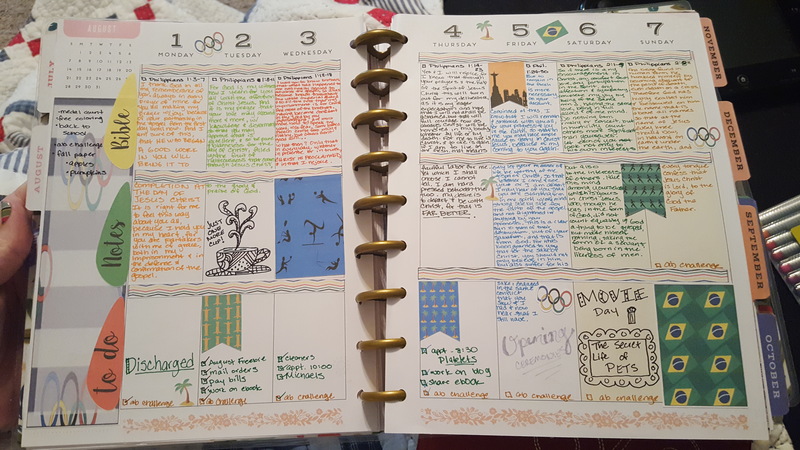 A few months ago, I changed the lay out of my planner and made it more of a journal than a calendar. I started doing daily scripture writing and found the weekly spaces to be perfect for my needs. What is daily Scripture writing??? It’s just what it sounds like. Writing out portions of Scripture daily. I don’t know about you, but many times when I sit down to read my Bible, my brain just can’t seem to absorb the words. It might be the ADD. It might be the 4 kids that have siphoned all my energy out like tiny gas thieves. It might be that I’m getting old (my 11 year old called me middle aged the other day… *gasp*). For me… writing out the words helps cement them in my heart and mind. So now, I take about 10 minutes or so each day to write out Scripture. Sometimes I get creative with my lettering, but most days I just write. I underline or write in all CAPS when something stands out. 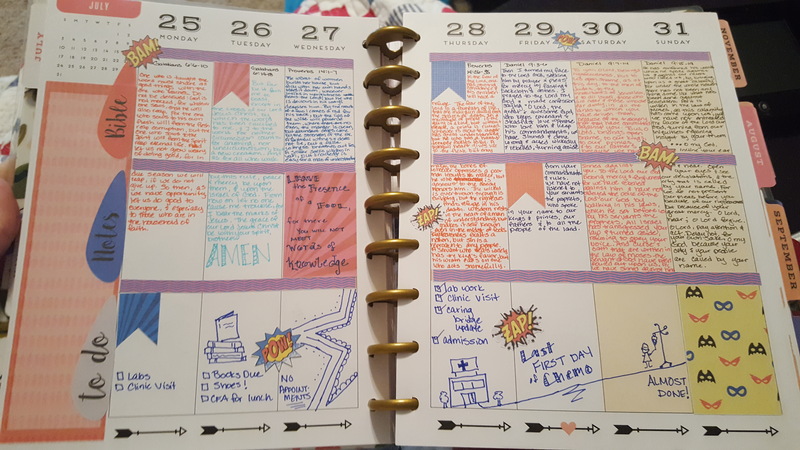 I have my planner divided into three sections… Bible, Notes, and To Do. Most days, the Bible writing trickles down into the notes section, but that’s ok. I use the To Do section to daily to-dos and for memory keeping. 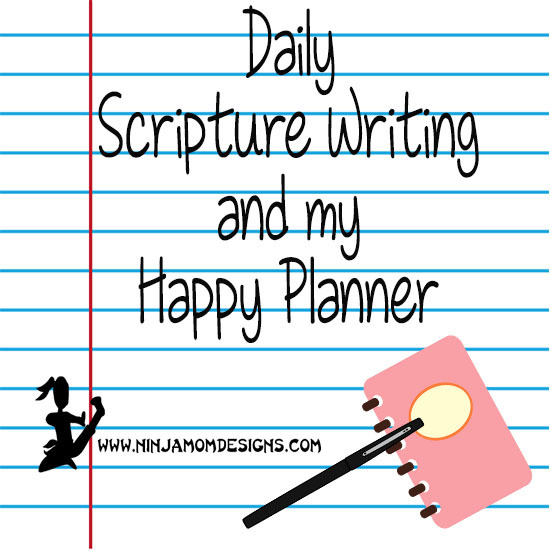 I’ve been using the Daily Scripture Writing Plans from the Busy Mom. You could get on Pinterest or Instagram and search for daily Scripture and you’d find all kinds of ideas. For now, this is how I’m enjoying my Happy Planner from Me and My Big Ideas. (You can get one from Michael’s, Hobby Lobby, Amazon, or Blitsy). In fact, they just released a new Faith Planner that is undated and very open ended for people who want to use their planners in a more focused way. Pretty Cool. I make stickers to go with my system. I like making fun layouts so that each week has it’s own theme. Each layout has a side bar piece, washi strips, a couple of boxes, some flags and some fun accent stickers. As I am designing, I am adding them to the Etsy shop. You can take advantage of the Bible Study Sticker Kit Value Pack and save money when you buy more! How do you use your planner???? I love this idea! I have a big binder for my homeschool planning and like you, I have the calendar on the wall. But I love all the beautiful stickers and little boxes made just for planning. So I’ve decided I’m going to do faith journaling in my planner!